"I was never meant to be just ordinary." Scarlett Blake's life was turned upside down when her sister committed suicide, but things became even more complicated as she tried to figure out why. She never imagined anything like this being possible, let alone happening to her sister. And she certainly never imagined she'd find herself in the same situation. 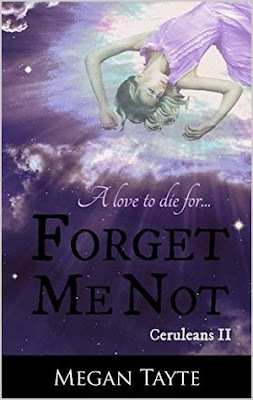 I don't want to say much about what happens in this story plot-wise because it's so intricately put together that even a little would give away too much if you haven't already read the first book, but I can say that Forget Me Not was even more emotional and heart-wrenching than the first book in the Ceruleans series, Death Wish. My heart broke for the characters, especially Scarlett as she tried desperately to figure out how to protect her friends and family from the pain of her inevitable loss. to bring comfort and happiness. Yet if anything, he looked sadder." I really enjoyed that we learned more about the Ceruleans in this book. Scarlett's choice is clear: once she dies, she has to choose Jude. Go to Cerulea. Figure out how she can save her sister from the Fallen. But the Fallen have other ideas. They want Scarlett for themselves, but Scarlett knows that she can't give in to them if she wants to help her sister. There were so many parts in this story that had me in tears but just as many that made my heart incredibly happy. I've loved Scarlett as an MC since the first book and have always thought she was an admirable heroine, and she and Luke are perfect for each other. I love when you can really feel a character's emotions, and the way Scarlett talked about Luke was heart-achingly beautiful. I also loved Scarlett's relationship with Jude. It was strained at times, but it's obvious that all Jude wants is to do the right thing and take care of Scarlett as much as he can. I felt for Jude on a whole new level when I learned some of what he'd been through and the things he has had to deal with, and it broke my heart how hard some of the characters were on him. I absolutely adored the second installment of this amazing series, and I can't wait to start the third book, Wild Blue Yonder, soon. This sounds really good! Fab review. :) I'll go check it out! This sounds like a good series and the paranormal aspect sounds really intriguing. I'm so glad you are enjoying the series so much. Great review! Wonderful review Mckenzie. I love when a book gets you caught up emotionally. Thank you, Ms. Kimba! I love that, too. This sounds like it was a pretty emotional read! And the premise sounds so very interesting. I'm very curious myself how it all played out. I'm glad to read you really enjoyed Scarlett! Sounds like a wonderful paranormal series to get lost into! AWESOME review, Mckenzie! I loved your take on this book!